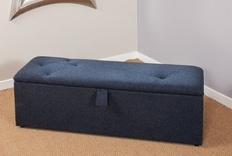 We specialise in upholstered ottoman boxes, bedroom storage boxes, blanket boxes, children's toy boxes and padded storage benches made to order in any size, colour and fabric. An ottoman box can be perfect for night time storage of the bed's decorative soft furnishings while serving as a comfortable seat and a fine piece of furniture in its own right. 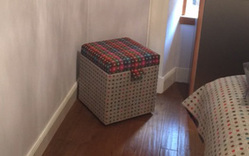 The Ottoman storage box is also ideal as additional bedroom storage used as a children's toy box or dressing up box or as occasional seating in a recess or window space. 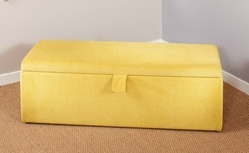 We will tailor your ottoman to the perfect width, height, colour and style best suited to your bedroom. On the website we have shown only a few of the upholstered lid designs available. Our Ottoman lids can come made in all sorts of styles from the traditional to the ultra modern and unique designs of upholstery. If you have a lid design or colour scheme in mind let us know and we will make it for you. As the ottoman can be the link between your curtains, soft furnishings and bed you may supply your own material (FR) or choose from our extensive range of contemporary fabrics. Please see our fabric section for ideas of the vast range of colours and textures available and contact us for free fabric samples. We will be delighted to discuss your plans and price them on request.